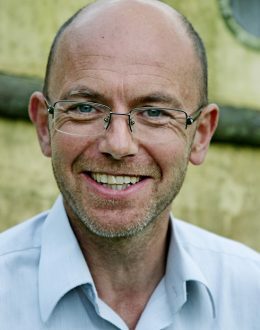 Wayne Hemingway was born in 1961 in Morecambe. Wayne’s earliest memories are of his mum and Nan dressing him up as Elvis, a Beatle or Tarzan and being paraded up and down Morecambe pier or being held aloft in a wrestling ring by his Native American father, Billy Two Rivers. These early child-modeling stints went some way towards influencing the youth who was forever experimenting with styles and cultures and reinventing himself whenever the next big “thing” came along. Northern Soul was discovered at the tender age of 13, then Disco, Punk, New Romantic and Rockabilly. Hemingway left Queen Elizabeth’s Grammar School, Blackburn with 10 O Levels and 4 A Levels. In 1979 he gained a Degree in Geography and Town Planning at University College, London. The move that sealed Wayne’s fate was taken to fuel funds for the band that he then played in. One day he decided to empty his wardrobe and that of his childhood sweetheart (now wife) Gerardine and took the contents to sell on Camden Market. The realization that money could be made from fashion suddenly dawned. With Gerardine, Wayne built Red or Dead into a label that received global acclaim resulting in winning the prestigious British Fashion Council’s Streetstyle Designer of the Year Award for an unprecedented 3 consecutive years in 1996, 1997 and 1998. After 21 consecutive seasons on the catwalk at London Fashion Week, Wayne and Gerardine sold Red or Dead in a multi million cash sale. In 1999, they set up HemingwayDesign, which specializes in affordable and social design. The highest profile project is The Staiths South Bank, a 800 property mass market housing project in Gateshead for George Wimpey Homes where HemingwayDesign are involved from the master planning and architecture through to the landscaping and marketing of this groundbreaking project. Wayne is the Chairman of Building for Life, a CABE (Commission for Architecture and The Built Environment) funded organization that promotes excellence in the quality of design of new housing. He is a Professor in the Built Environment department of Northumbria University, a Doctor of Design at Wolverhampton, a writer for architectural and housing publications as well as a judge of international design competitions including the regeneration of Byker in Newcastle Upon Tyne and Salford in Greater Manchester and the Stirling Prize, Europan and a TV design commentator. He has also just received an MBE and is Chairmain of the South Coast Design Forum. He recently designed the Bug DAB Radio for PURE Digital. Wayne is also a lifelong Blackburn Rovers fan. In November 2007, Wayne designed some t-shirts for animal welfare charity the RSPCA.